Wichita, Kan. – Nothing takes away the chill of winter like a cup of hot cocoa made with rich melted chocolate or cocoa powder. Okay, so maybe cold weather just makes us feel better about indulging in a heavenly cup of chocolaty goodness. Either way, Visit Wichita has rounded up eight hot cocoa experiences in Wichita that is sure to hit the spot. We’ve even included a few non-chocolate treats. The best part is that most of these drinks are available year-round. Churn & Burn: If you find yourself craving ice cream but wanting something warm, head to Churn & Burn for a cup of its house specialty hot cocoa that is so rich it tastes like a scoop of chocolate ice cream was heated into a drink. Like its ice cream, Churn & Burn makes this drink from scratch with milk, heavy cream, sugar, brown sugar, vanilla and cocoa then tops it with house-made whipped cream. Cocoa Dolce Artisan Chocolates: Kansas’ only master chocolatier serves artisan confections and beverages in the state’s only chocolate lounge, renovated in fall 2016. So, it’s no surprise the menu includes seven amazingly delicious hot chocolates – including a sugar-free Belgian. Two of the most popular are Mexican and Mayan. 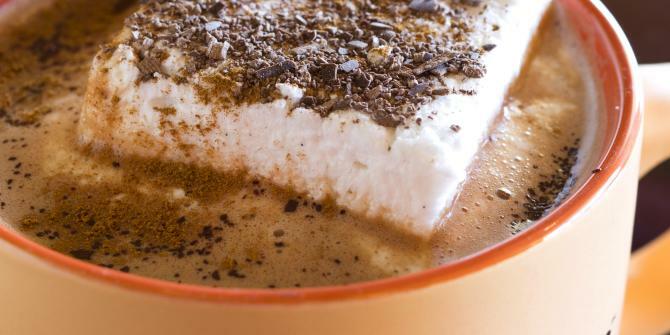 The Mexican hot chocolate is made with bittersweet chocolate, brown sugar, cinnamon and vanilla. The Mayan hot chocolate combines bittersweet chocolate, honey, cinnamon, vanilla, ancho chili and crushed almonds. For an extra treat, have them top your drink with a Tahitian vanilla bean marshmallow. The lounge’s baristas can also turn any of the hot chocolates into a Cocoa Mocha, and the mixes are available to buy and make at home. The Donut Whole: What could be better than devouring a fresh donut made from scratch using Kansas-made buttermilk, eggs, butter and flour? Chasing it with a tasty beverage, made to order. The baristas behind the coffee bar at The Donut Whole make hot cocoa in milk, dark or white chocolate every day of the year. In the fall and winter seasons they serve Autumn Creme drinks: hot white chocolate in your choice of three flavors – pumpkin spice, maple spice or spiced brown sugar. We know it can be tough to choose from their 40-plus fun flavors of cake donuts, so here’s a little help: the Cinnamon Streusel, Maple-Bacon (topped with fresh, crispy bacon), Half-Nutty Maple and Pumpkin Spice donuts pair well with any of the Autumn Creme beverages. Espresso To Go Go: Celebrity chef Alton Brown calls Espresso To Go Go his “Wichita happy place” and he’s visited both the Unicorn and the Disco Ball locations. The experience here matches the excellence of the beverages, including their hot chocolate made with steamed milk, the perfect mix of chocolate and sweetened condensed milk and topped with whipped cream. We had you at unicorn, didn’t we? Mead’s Corner: This fair-trade coffeehouse makes a creamy, rich hot chocolate by combining white and dark Ghirardelli chocolate with a splash of vanilla and steaming the milk to order. This time of year, they replace the vanilla with pumpkin spice or peppermint for a festive beverage, though you can get creative and add any of the 40-plus flavors they offer. Whipped cream finishes the drink. R Coffee House: Want live music and art with your hot chocolate? Head to R Coffee House, which features live music most days of the week and rotates local artists’ work on its walls. Their expert baristas serve up tasty takes on hot chocolate: one flavored with gingerbread syrup, a candy cane version and the indulgent s’mores, a chocolate and toasted marshmallow flavored drink topped with toasted marshmallows, graham cracker crumbles and a dash of cinnamon. A non-chocolate option is a cup of sweet, creamy caramel dulce de leche. Reverie Coffee Roasters: You’ll be standing in a working coffee roastery, but there’s no shame in ordering a hot cocoa in Reverie’s café. They make their own chocolate sauce from Cocoa Dolce cocoa powder and combine it with another local ingredient, Hildebrand Farms Dairy milk. This fall and winter they are also serving hot apple cider and a new drink special, matcha latte featuring single-origin fine powder green tea sourced from Uji, Japan, through Mizuba Tea Co.
Watermark Books & Cafe: Take a break from perusing the shelves of Wichita’s local, independent bookstore and enjoy a cup of hot cocoa spiked with one of their syrup flavors; peppermint, Irish cream, toffee or salted caramel are just a few of the yummy options. You’ll also be tempted by the made-from-scratch scones, cakes, muffins, cookies, bars, pies and cinnamon rolls.